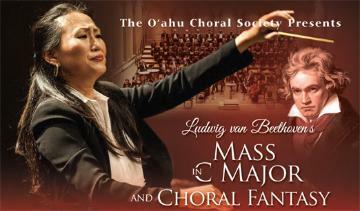 The O‘ahu Choral Society will open its 2014-15 season with an all-Beethoven concert featuring two of his earlier works for chorus and orchestra. Beethoven’s Mass in C Major op. 86, written in 1807, is an unexpectedly peaceful and sublime expression of faith. The Choral Fantasy, op. 80 written in 1808 is an exciting set of variations for piano and orchestra culminating with soloists and voices - a work which foreshadows the ninth symphony “Ode to Joy” theme. The performance will feature pianist Thomas Yee, soloists Amy Mills, soprano, Laurie Rubin, mezzo soprano, Jim Price, tenor, and John Mount, bass, along with the 100-voice choral society, and musicians of the Hawai‘i Symphony all under the direction of Esther Yoo.